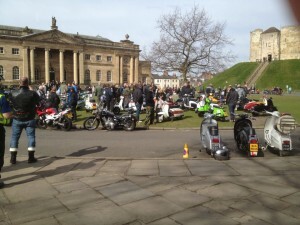 The York Inset Scooter Club is based in York (UK) and has a membership of around 250. They are a thriving, active club and look to support local charities when they can. They have an annual Mods and Rockers charity ride out, and for 2019 have agreed to support The York ME Community. They will head off from The York Eye (Clifford’s Tower) on a run out to the coast on Sunday 28 April, and be set off by the Mayor of York and the York Normandy Veterans. All money raised will be used to improve the profile of ME in York through posters being produced and put up in local business premises, clubs, schools, GP Surgeries and venues. The picture shows the club gathering before last year’s Charity Ride Out. If you would like to come along on the day to see them off, put the date in your diary now and I’ll confirm timings in due course on this website.